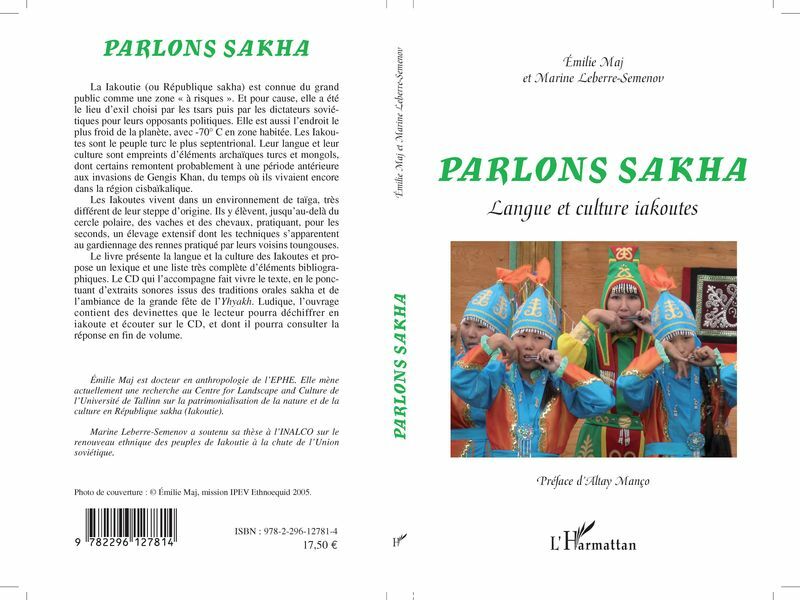 Le livre Parlons Sakha. Langue et Culture iakoutes vient de paraître. Un CD contenant proverbes, dictons, ambiances et musiques est également disponible. autour de la Iakoutie le 13 janvier 2011 à 2Oh à Paris. Depuis 2007, Emilie Maj propose des ateliers pédagogiques et des conférences destinés à des publics enfants, jeunes et adultes concernant la culture des Iakoutes et la vie dans le Nord. Consultez les albums et les articles sur les ateliers et conférences précédents ! 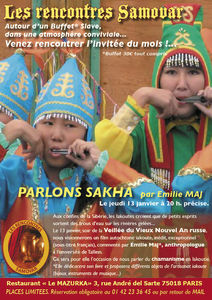 Je suis campagne de recherche pour l'Institut Paul-Emile Victor (www.ipev.fr) du 19 juin au 13 août 2009 en République Sakha (Iakoutie). Je participe les 23 et 24 septembre 2009 à une conférence organisée à Trömsö, dans le nord de la Norvège, intitulée "Contested identities, contested cultures and contested rights. Change and challenges in the Northern European periphery". In his Shamanism: Archaic Techniques of Ecstasy, Mircea Eliade rehabilitated Shamanism as a religion and gave to the shaman a greater value than as the possessed. Indeed, for him the shaman was the “master” of the spirit, when the possessed had a passive relation to spirits. Through cases study, the seminar will examine the differences between shamanism and possession, two kinds of relationship with spirits. We will analyze possession as a peripheral phenomenon (which develop parallel to great religions) and shamanism as religion in the center of the society. Both of them implied a role of the body and the soul and are qualified as “ecstatic”. That is why this study needs a comparison of the behavior of the shaman and the possessed, the role of the space (notion of travel) as well as of the music, dance and other elements during the ritual. Pittin, R. (1996). Possession and dispossession: Changing symbolic structures and meanings in contemporary Nigeria. The Politics of Cultural Performance. D. Parkin, L. Caplan and H. Fisher. Providence, RI, Berghahn: 199-216. J'interviens durant une conférence intitulée "The Changing Face of Music Education (CFME09) / Music and Environment" entr ele 23 et le 25 avril 2009 à Tallinn. 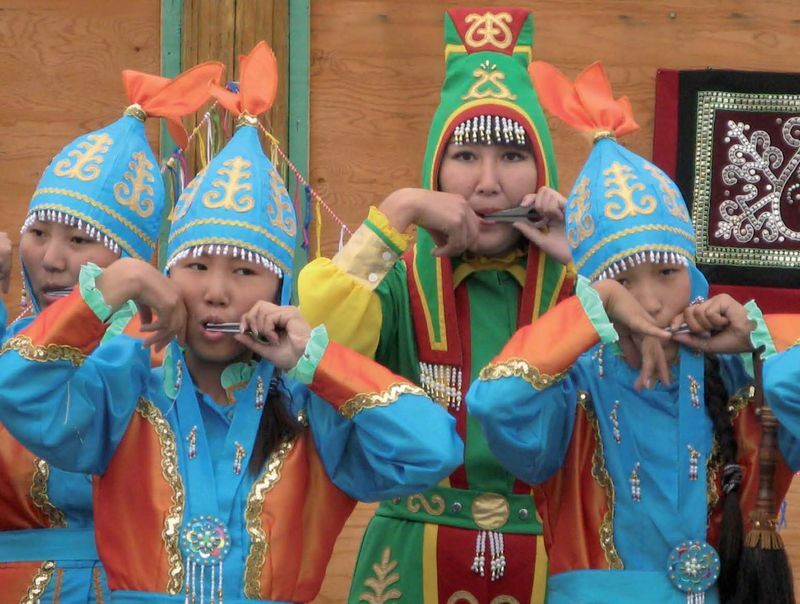 THE JEW’S HARP IN YAKUTIA: RELATIONS BETWEEN CURRENT INDIVIDUAL LEARNING PRACTICIES AND THE INSTRUMENT AS AN ETHNIC SYMBOL. The jew’s harp is played in different parts of the world, but in postcommunist Republic Sakha (Yakutia – Siberia) the jew’s harp (khomus) is particularly significant in Yakut society. 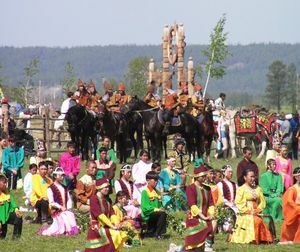 Khomus is currently one of the emblems of Yakutia and Yakut people. This instrument is still made by Yakut blacksmiths, who are in competition to make the best instruments, which may become famous because they are played by professional musicians and sold to foreigners. 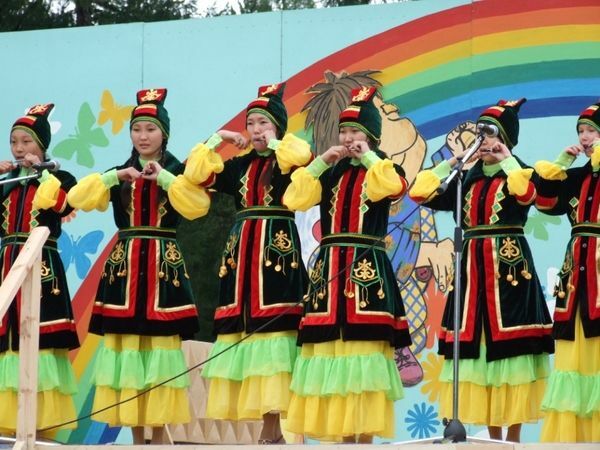 This position of the khomus as an ethnic instrument is quite new in Yakutia. The main idea of the paper is to present how, in the biggest Republic of Siberia, the learning practices of the jew’s harp changed since the fall of the USSR in relation with the social transformations. Indeed, ethnographic researches among the old generation show that, at the beginning of the century this instrument was only an intimate instrument, mostly played by women. According to Khudjakov, one famous Russian ethnographer of the end of the XIXth century, khomus was use by female shamans during rituals. Today, playing the khomus is a manner for a person, a men or women, to claim that he or she belongs to Yakut people. Cultural representatives of the government organize festivals and concerts, during what family groups or groups of a hundred people use to play. A diachronic analysis will explain the relation between these facts. The participative observation gives the opportunity to understand the methods of learning and to see that, even if professional musicians try to write music for the khomus, this instrument still necessitates an oral learning. What was only an improvisation practice becomes progressively codified by blacksmiths and musicians, who divide the khomus in two categories: the singing and the talking instruments. My hypothesis is that the khomus as an instrument of improvisation is the best music instrument for a people, which was at the beginning of the XXth century without writing. 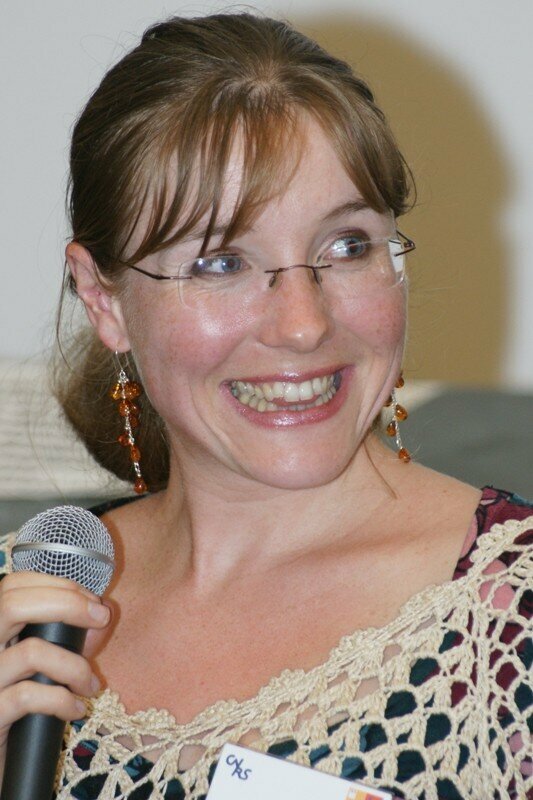 During my talk, I will propose to listen to the typical Yakut jew’s harp sounds and to watch pieces of movies. It will help me to show the ethnic implications of the musical education thought the example of people who had only oral traditions before the Soviet period. J'interviens à Orléans lors d'un colloque sur le sacré dans la nature organisé par la faculté de géographie. Je parlerai du "Cours d'eau chez les Sibériens, direction, lien, route pour les vivants et les morts (l'exemple des Iakoutes en République Sakha Iakoutie). J'ai proposé aux Grands de l'école maternelle Philibert delorme à Lyon deux ateliers sur la demande de Virginie Eraclas. Ce fut un plaisir de faire chanter et danser les enfants et de leur faire comprendre ce que peut être la vie en Sibérie.